The game opened relatively cautiously with both teams focusing on preventing odd-man rushes and keeping the opposing team out of the middle of the zone. 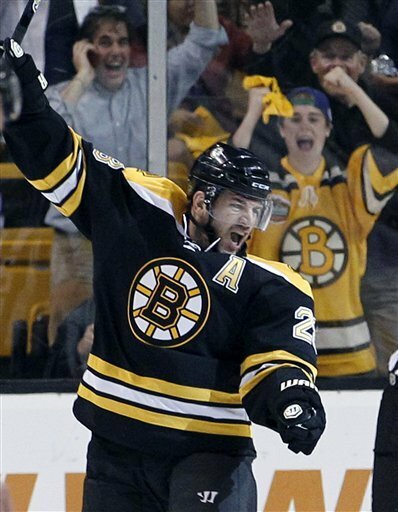 The Bruins got out on top early however, just 3:31 into the game on a Johnny Boychuk blast from the point. Brad Marchand did a good job along the boards then fed a saucer pass up the boards to Boychuk. Boychuk then fired the shot low through traffic which beat a preoccupied Carey Price low to give the Bruins the crucial first goal. The Bruins would get a second goal just two minutes later when Mark Recchi jumped on a loose puck in the slot and beat Price just under the bar blocker side. Andrew Ference pinched in and kept the puck alive in the offensive zone and then fisted the loose puck into the center of the zone and Recchi ran up to the puck and blasted it home. The Canadiens would get the first power-play of the game when Michael Ryder was sent off for hooking in a puck battle. Yannick Weber would take advantage of Daniel Paille losing his stick on the penalty-kill when Michael Cammalleri fired a pass through the box and Weber buried a high shot over Tim Thomas‘ glove. Paille could have risked it and skated to the bench to get a new stick but didn’t and 10 seconds later the Habs cut the lead in half. The Canadiens seemed to benefit from the early timeout, bottling up the Bruins in the Boston zone. The only line that had consistently good shifts was the Patrice Bergeron line. Shawn Thornton would be sent off with four minutes left in the period when he was called for elbowing in a battle for puck possession behind the net. The Bruins would kill off all but three seconds until Andrei Kostitsyn was sent off for high-sticking trying to deke into the zone. The Bruins power-play was stationary as ever and didn’t score, bringing the teams to the end of the period. Montreal nearly tied it up on the first shift of the second period but Thomas kept the Bruins up with a toe save on a rebound bid by Brian Gionta. Montreal then started to take it to the Bruins in the opening minutes, grinding out long shifts in the Bruins zone as the Bruins defense continuously had trouble getting the puck out of their zone. Lars Eller would give the Bruins a power-play when he was called for cross-checking five minutes into the period, seemingly stemming the tide for a while. True to form, the Bruins power-play was terrible, and a turnover at the red line quickly turned into a shorthanded goal by Tomas Plekanec. Plekanec was all alone from the red line and picked it off the blocker side post and in. The terrible pass in the neutral zone was the last line of defense. Tim Thomas would redeem himself with a breakaway save on Jeff Halpern during a Bruins line change. Halpern tried to go five-hole but Thomas sealed it off. Johnny Boychuk would take a stupid penalty when he was called for boarding when he hit Halpern into the stanchion with 1:48 left in the second period. Thomas made a big save early on, going across the grain to grab a hard shot with his glove. The Bruins would kill off most of the penalty and the Habs would take the remainder to the dressing room, earning a 2-2 tie in the middle frame. Mark Recchi had a great chance early in the third at the right post on a rebound in the Montreal crease but he couldn’t get the puck while being battled and when he finally did, Price came over and the post was able to make the save. The Bruins came out a lot better in the third period, skating up the zone more freely and keeping the Canadiens off their toes. Chris Kelly would put the Bruins up with 10 minutes left on a rebound goal. Kelly started the play with body contact at the center line against Roman Hamrlik. Hamrlik stayed down and looked for a penalty call while the Bruins broke into the zone. Rich Peverley got a shot off but it was deflected down, Chris Kelly tracked the puck well and put a backhander under Price all while the Canadiens looked for a penalty that wasn’t there. Kelly nearly scored again on a breakaway going blocker side on Price but Price snuffed it out. The rebound ended up bouncing up and trickeld down the back of the net. The Bruins would take a timeout after an icing call with 6:40 left in the third period. Price would come up big again with a swooping glove save on Recchi with around four minutes left on a Bruins odd-man rush. Patrice Bergeron would be sent off for a reckless high-sticking call 200 feet away from his net with just over 2:30 left in the third period. P.K. Subban would make the Bruins pay when he hammered home a rocket one-timer directly over Thomas’ head. Plekanec found him from one corner to the other and unleashed a rocket for the game-tying goal with 1:57 left. The game would go to overtime. The overtime began with some rushes each way and Montreal dictating play. Thomas made a few saves on deflected pucks that would have otherwise went in and Seidenberg nearly booted a puck in the Bruins net early on. The teams began to slow down after the five minute mark, much to the Bruins advantage. Nathan Horton would end the series on a bullet from the high slot off of a faceoff in the Montreal zone, on his first shot of the game. After a great cycling shift with McQuaid pinching down to keep it in, Adam McQuaid dished down to Milan Lucic who then fed Horton from the boards into the high slot. Horton had ample time to get off his heavy wrist shot and beat Price glove side to exercise the Bruins Game 7 demons. The Bruins will go on to play the Flyers in the second round. Look at a replay, the high stick on Bergeron was BS, a total dive. The stick never touched his face or head. So, bad news for the Habs is their season is over. Good news is they’ve all been selected for the 2012 Candian Olympic diving team. Good luck in London, boys. Bergeron can’t be playing that aggressive with under 3 minutes left 200 ft from his net. Even if he didn’t high-stick him it’s a reckless play in terms of aggression.